Gasabo intermediate court has postponed hearing in substance a case involving residents of two slums – Kangodo I & II and Kibiraro I also known as ‘Bannyahe’ against Gasabo district. Last year, Gasabo had proposed to expropriate the residents in exchange of new apartments under construction in Busanza, Kicukiro district. The city wants this slum to look like the high-end Nyarutarama neighborhood across the road. Residents contested the offer while saying it does not have value for money and want compensation to be in cash. They requested the district to use the traditional procedure to evaluate their properties and give them money to settle where they want, in vain. 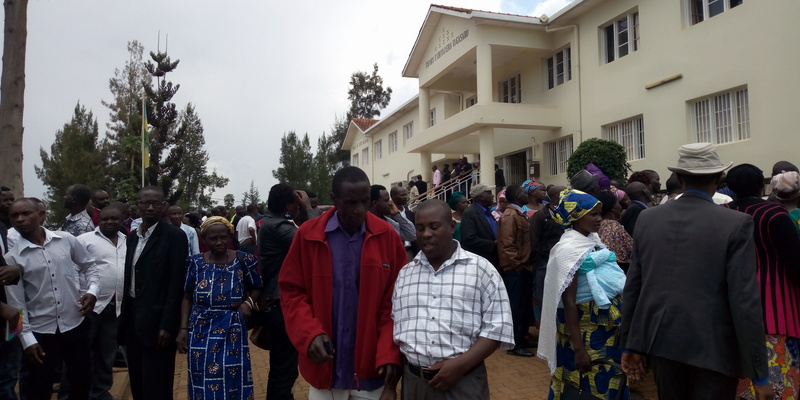 On February 6, 2019, residents headed to the court in hundreds expecting the case to start in substance as it was promised on December 7, 2018 during the pre- trial hearing. However, barely had the presiding judge opened the floor, the Gasabo district attorney Justin Niyo Rushikana told the court that there are substantial reasons why the case should be dropped. Niyo Rushikana said, that it does not make sense how two villages claim to be involved in the trial, while only four people are on the list of plaintiffs. In previous stories, it was reported that people involved in the trial are around 700, but the defendant attorney said that the list of complainants is limited to the four people. He also said, that in cases that involve public entities like in this one, residents should first proceed by filing their complaint to several public organs before taking it up to litigation. “From what I read, they never filed their complaint to any organ prior to coming to court. This alone is a reason why this trial should not be,”Niyorushikana said. And he added that in case the case proceeds in substance happens, the complainants should be represented by lawyers. However, in the pre-trial hearing – December 7, 2018, complainants had presented two lawyers to represent them and they expected that it the issue of representation was deal done. In court, the complainants had Innocent Ndihokubwayo and Boniface Nizeyimana for lawyers. They dismissed all allegations of the defendant. For example, they did not agree on the fact that the citizen needed to file separate cases. “Imagine filing seven hundred trials at ago. The court would not receive them,” said Nizeyimana. Supporting him, Ndihokubwayo added that the interests in the trial are the same which rules out the claim that they needed to file different cases. The court said it will examine if the case is relevant or not. Ruling is scheduled on February 11, 2019.